From recording images to lifetime calculation and data analysis. Our advanced software instantly analyzes your data and presents the calculated fluorescence lifetimes visually. Record fluorescence lifetime imaging microscopy (FLIM) data in a matter of seconds. Compared to alternative methods like time-correlated single photon counting (TCSPC), the LIFA is over 100 times faster. Our advanced software instantly analyzes your data and presents the calculated fluorescence lifetimes visually. Recorded images are compatible with ImageJ, FIJI, Matlab and MetaMorph. Detailed statistical data can be exported to Excel worksheets. 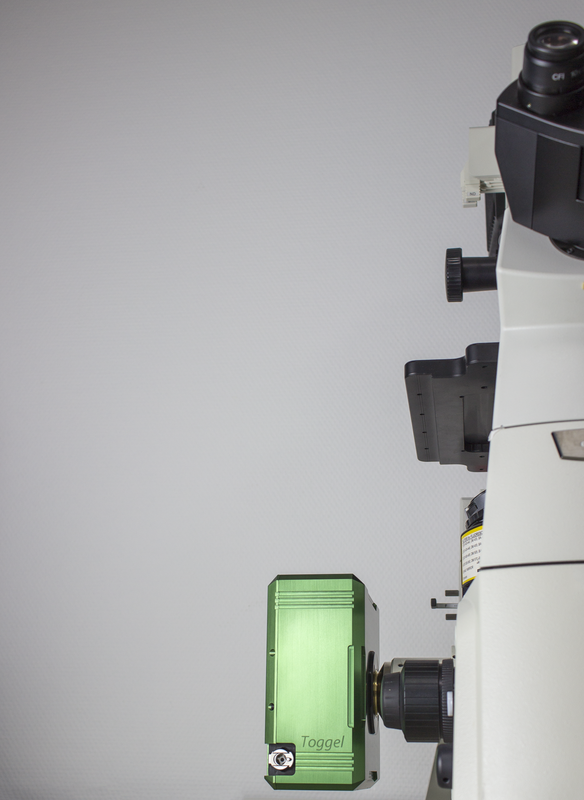 The LIFA is compatible with every fluorescence microscope with a camera output. This includes fluorescence microscopes by Leica, Nikon, Olympus, TILL and Zeiss, as well as confocal microscopes and TIRF microscopes. At the university of Bordeaux Segalen, the molecular mechanisms underlying memory storage in the brain are being unraveled by studying protein accumulation at synapses. With the LIFA attached to a confocal spinning disk microscope, lifetime imaging of synapse-specific interactions in live neurons allowed the researchers to show and quantify the synapse specific interaction of the two proteins of interest. Fluorescence imaging can be used to obtain a chemical signature of oil. All kinds of oil, from edible to motor oil, are distinguishable using fluorescence analysis. For more information, please refer to our application note on time-resolved fluorescence in the analysis of edible oils. Successive lifetime fields in axial position x. Quantitative visualization of the increasing boundary layer thickness along downstream flow (45 μl/min). The flow direction is from left to right. The color bar refers to the lifetime, which is given in nanoseconds. The dashed arrows indicate the axial positions at which the local oxygen concentration profiles across the microchannel height are obtained. Researchers around the world use the LIFA in their studies. Below is an overview of the most recent publications describing research that was done using a LIFA. For a complete overview of applications, please refer to our applications pages and our overview of selected LIFA publications for more information. An overview of the available LIFA models. 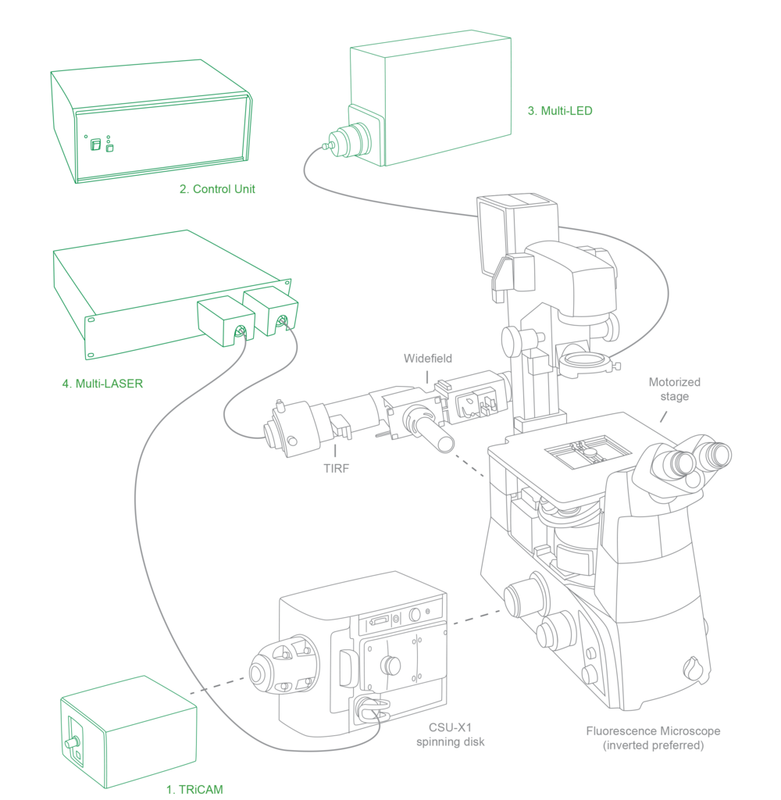 All LIFA components (green) and the microscope hardware are shown in the illustration on the left.